"Working for efficiency" is not just a slogan. Working for continuous improvement is for the team "Working for efficiency" a mission that involves all business activities: from the recruitment of qualified personnel constantly looking for innovation, from the quality, environment and safety certification, up to the development of new products; aware that in order to maintain and increasingly consolidate its position in the market it is necessary that there is a constant tendency towards continuous improvement in productivity and professionalism, based on a collaboration with the customers in order to improve the efficiency of their own production. AT THE HEART OF EUROPE. AT THE HEART OF THE WORLD. "Working for efficiency" is a local entity with international presence. Its location on the territory in the south of Vicenza, in an area always thriving to small businesses and entrepreneurship characterized by a strong presence of skilled workers, puts it in a strong connection with the territory. Despite being a large company, with a production area covering over 40,000 square meters, it still keeps a human dimension and relationship with both the territory and employees. BORN TO BE ALWAYS AT THE HIGHEST LEVELS. 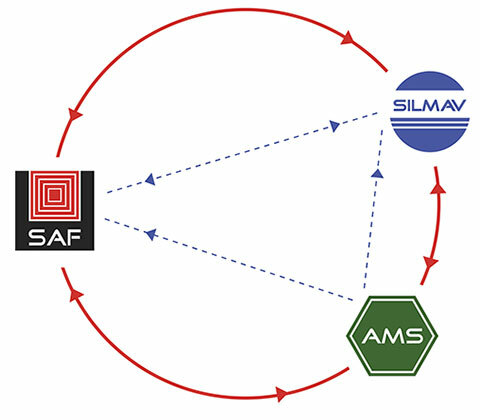 The "Working for efficiency" team consists of the SAF, AMS and SILMAV companies. Every company is independent, but commercially and strategically linked in order to offer a full range of products and services. The team is a leader in heating, cooling and sanitary sectors and is present in many other fields. The material ordered is carefully packed in accordance with the laws and customers' regulations and can be delivered with its own means throughout Italy of by couriers contracted abroad. Among established customers are the biggest names in the heating and cooling sector at the European level, whose multi-year partnership is founded on respect for the highest quality standards of product and service. The team also has a design and research centre whose mission is to follow the engineering team, taking care of the logistics, automation and design of new products. Thanks to a network of autonomous production units, located in different strategical territory, the team "Working for efficiency" is able to offer customers a quality guarantee of the product together with the respect of supplies agreed upon, both in terms of quantity and delivery dates, even in the event of natural disasters. The team turns its attention to the development of the territory in which he operates and to the preservation of the environment, the recruitment and integration of people with disabilities in its workforce and active participation in any local social initiative.